I remember spending most of my Summers wit my Grandma when I was growing up. My parents worked, she watched us while they did whenever we were out of school. That meant going to the Commissary with here every week for her weekly shop. Of course, we’d ask for this, that, and the other- we were kids. It was only natural. Occasionally, there was a rare ‘yes’, but more often than not- it was a firm no. It wasn’t on the list, so there wasn’t really anything to even begin to argue about. Especially, in the ice cream department. Let me say it again for the people in the back, especially in the ice cream department. 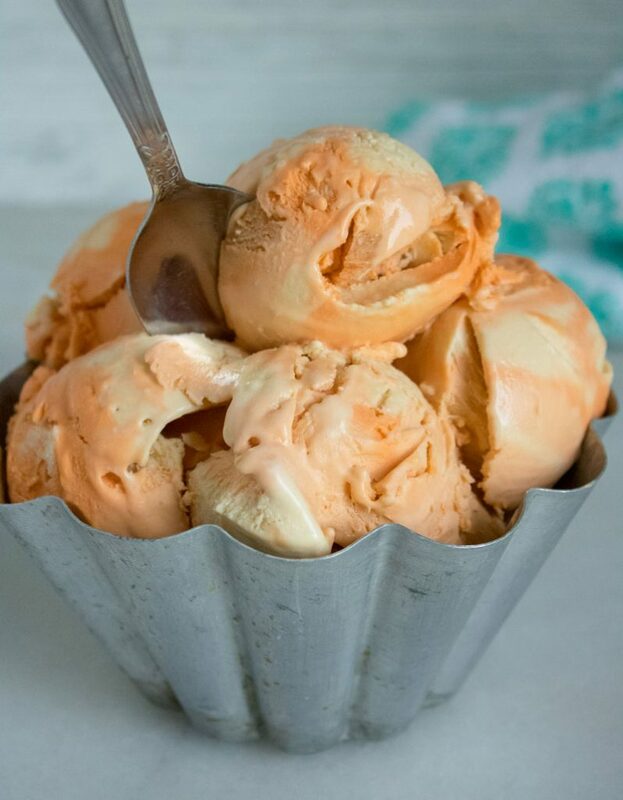 Yes, we were totally lucky in that Grandma always had ice cream on hand for us. But, if you didn’t like the flavors or brand Grandma did, then you were plain outta luck. Depending on which side of that you fell on, it could be very great or really frustrating, that Grandma didn’t vary much in her frozen sweet treat preferences. Her brand of choice was always Edy’s. There was no other brand for her; she swore by it. I’ve gotta say, the brand’s stood the test of time for me. She always had their strawberry or mint chocolate chip on hand, guaranteed. If, on the rare occasion, she didn’t have a pint of ice cream on hand there was one other thing you could bet money on finding in her deep freezer. A box of orange dreamsicle popsicles. 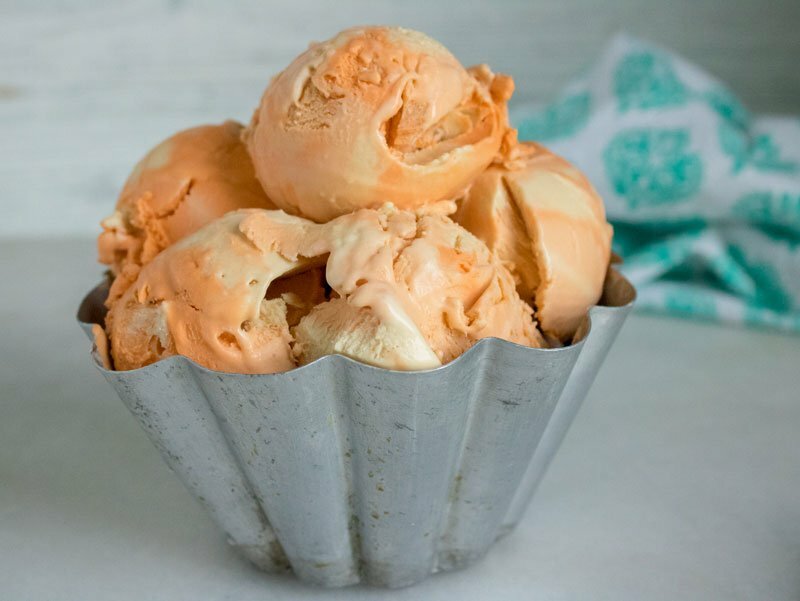 So while it’s not the same as those beloved little frozen sticks of sugary wonder, in her honor & memory, I am sharing with you our recipe for No Churn Orange Dreamsicle Ice Cream. It tastes just as yummy, but a tad less messy and minus the popsicle stick. Even better? Since you can get it by the scoopful, you can really (completely) sate your craving whenever it strikes! 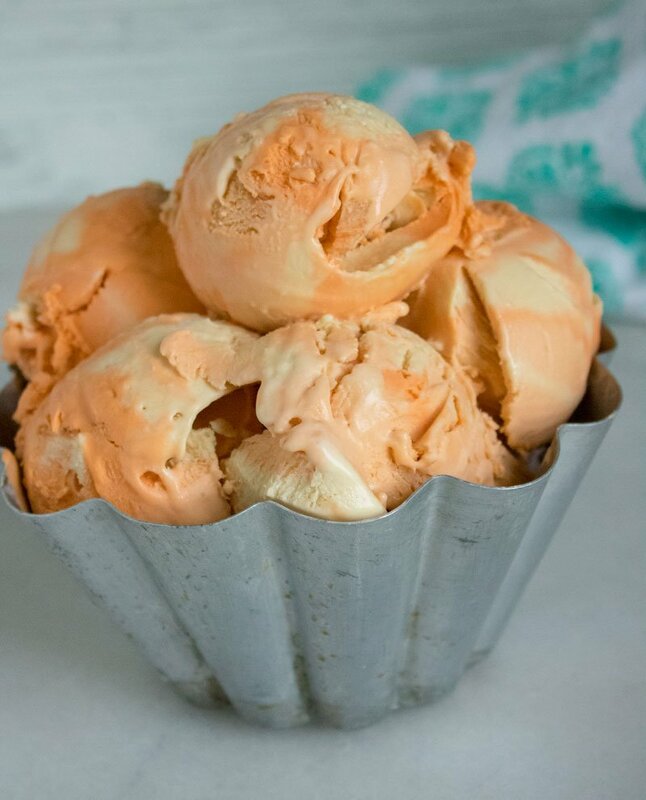 The classic dreamsicle flavor combination of zesty orange and heavenly cream are swirled together in every scoop of this ultra creamy, easy ice cream. No fancy machines required to enjoy this rich, indulgent dessert. 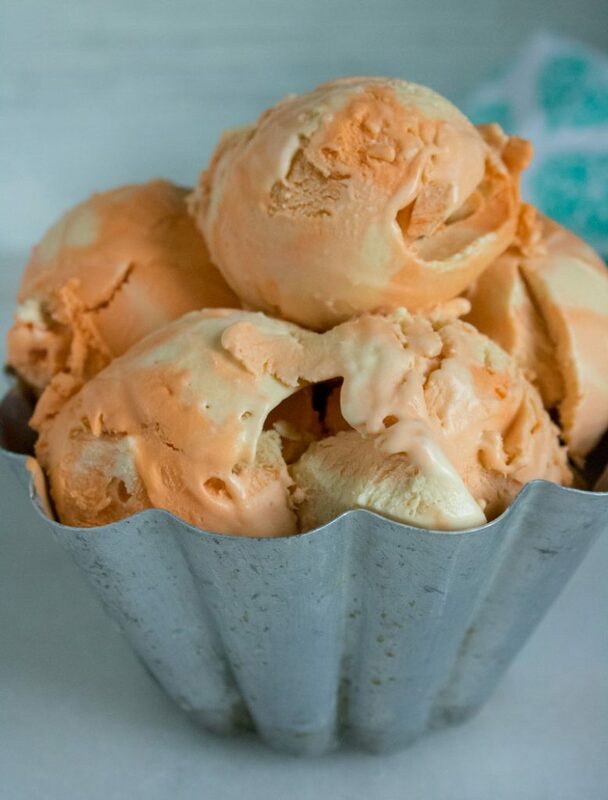 Just a couple simple steps stand between you and your own batch of our No Churn Orange Dreamsicle Ice Cream. Heavy cream is whipped until thickened with stiff peaks. Sweetened condensed milk, food grade orange essential oil, and vanilla extract are stirred into the whipped cream. Next, the mixture’s divided evenly between three bowls, two of which we’ll add a couple drops of coloring to create two different shades of orange. After that the mixture’s alternately added to a dish, frozen until solid, and ready to be served- along with a bevy of good, old-fashioned memories. 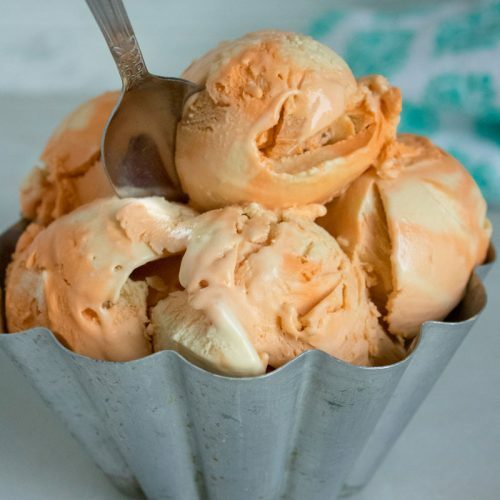 Other No Churn Ice Cream Recipes You Might Also Enjoy: 4 Ingredient, No Churn Nutella Ice Cream, Blueberry Muffin No Churn Ice Cream, Frozen Hot Chocolate Ice Cream, & Raspberry Cheesecake Ice Cream. 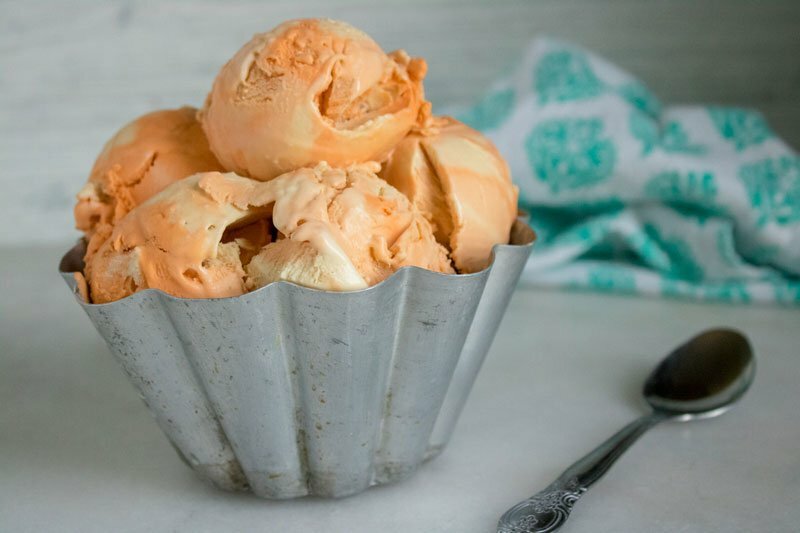 One of your favorite childhood treats, the classic orange dreamsicle, is now turned into a delicious no churn ice cream that's ready to be whipped up whenever a bit of nostalgia hits. With a mixer, whip the heavy cream until thickened with stiff peaks. Pour in sweetened condensed milk, vanilla and orange oil- folding in until smooth. 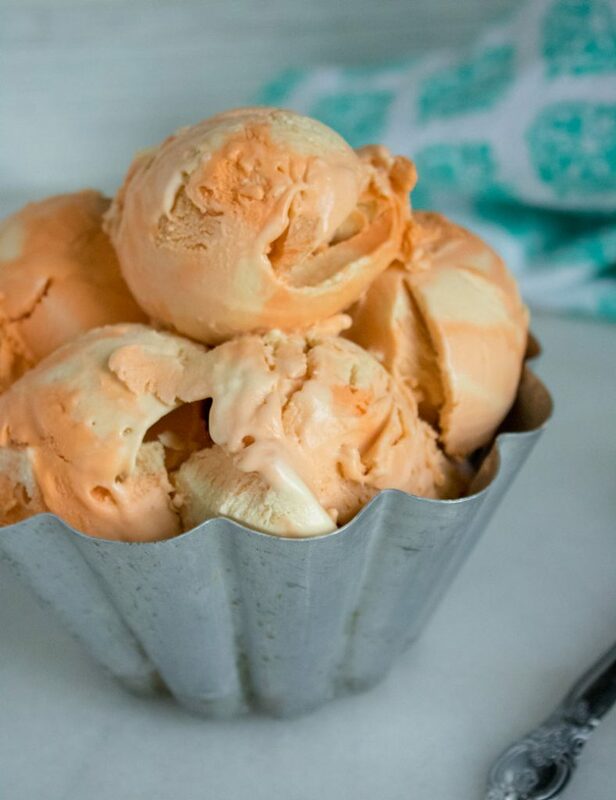 Divide ice cream into 3 different bowls, leaving one white, and adding gel food coloring to the other 2 to create two different shades of orange. Next, spoon ice cream into a freezer safe container, or metal loaf pan, alternating colors to create an multicolored ice cream. Freeze for 5-6 hours, or overnight. When it is time to serve, remove from freezer and let sit on the counter for 5 minutes to soften before serving.